Not to be confused with Monaco national football team. Association sportive de Monaco football club, commonly referred to as AS Monaco (pronounced [ɑ ɛs mɔnako]) or Monaco, is a Monégasque football club that competes in Ligue 1, the top tier of French football. Founded in 1924, the team plays its home matches at the Stade Louis II in Fontvieille. The club is coached by Leonardo Jardim and captained by Radamel Falcao. Though based in Monaco, the club plays in the French football league system. Monaco is one of the most successful clubs in French football, having won eight league titles and five Coupe de France trophies. The club has also competed in European football, and were runners-up in the UEFA Cup Winners' Cup in 1992 and the UEFA Champions League in 2004. The club's traditional colours are red and white, and the club is known as Les Rouges et Blancs (The Red and Whites). Monaco is a member of the European Club Association. In December 2011, two-thirds of the club was sold to an investment group led by Russian billionaire Dmitry Rybolovlev. With Rybolovlev's financial backing, the club quickly returned to Ligue 1 and won the 2016–17 Ligue 1, their first league title in 17 years. AS Monaco FC was founded on 1 August 1919 as a unification of numerous local clubs based in France and the principality. Then, the multiple sports club of the Association Sportive de Monaco was founded on the 23rd August 1924. AS Monaco FC was then absorbed by the latter and became the football section of the enlarged Monegasque sporting club. The club's early years were spent in the amateur regional divisions of the Provence-Alpes-Côte d'Azur region, rising rapidly between the leagues in the 1920s. In 1933, Monaco were invited by the French Football Federation to turn professional. The Monégasques' first year of second division football ended in failure, however, as they were relegated to the amateur leagues the following year. By 1948, Monaco re-acquired its professional status and returned to the French second division; they subsequently consistently finished in its upper echelons, with this sustained effort resulting in promotion to the French first division for the first time in 1953. In 1960, Monaco coach Lucien Leduc led the club to its first professional trophy, the Coupe de France, beating Saint-Étienne 4–2 in extra time. This initial success was bettered in the following year with the club winning the French Championship for the first time in its history, qualifying for the European Cup. Leduc subsequently led the club to its first League and Cup Double in 1963. Upon Leduc's departure in 1963, Monaco endured a barren run, entrenched in the middle half of the league for the best part of the next decade and alternating between the first and second divisions after 1963. In 1975, Jean-Louis Campora, son of former president Charles Campora, became chairman of the club. In his second season, he brought back Leduc, who immediately won the club promotion to the first division and won them the championship the following year in 1978. Leduc subsequently left the club again in 1979, to be succeeded by Lucien Muller and Gérard Banide, both of whom were unable to halt the club's decline. The early 1980s saw a steady stream of successes in national competitions. Monaco won a title almost every other year; the Coupe de France in 1980 and 1985, the French Championship in 1982, was Coupe de France finalist in 1984. In the 1985–86 season, Monaco hammered Bordeaux 9–0, one of the biggest wins in club history. Disappointingly for Monaco fans, the club could not translate its domestic leadership into European success. Up to this point, Monaco had never passed the first round of any European competition. Monaco lost to Dundee United (1981), CSKA Sofia twice (1982 and 1984) and Universitatea Craiova (1985). Arsène Wenger led Monaco to the 1987–88 league title. The former AS Monaco logo used until 2013. In 1986, former Ajax manager Ștefan Kovács, who succeeded Rinus Michels and honed his Total Football ideals with the Dutch champions, came out of a three-year "retirement" to manage Monaco, but even he could not bring them success. With the club facing a second barren spell, they signed Arsène Wenger, who had hitherto been relatively unknown, managing Nancy without much success. 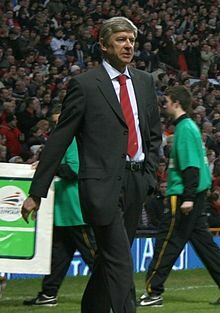 Wenger's reign saw the club enjoy one of its most successful periods, with several inspired signings, including George Weah, Glenn Hoddle, Jürgen Klinsmann, and Youri Djorkaeff. Youth team policies produced future World Cup winners Emmanuel Petit, Lilian Thuram and Thierry Henry. Under Wenger, they won the league in his first season in charge (1988) and the Coupe de France in 1991, with the club consistently competing in the latter stages of the European Cup and regularly challenging for the league title. The club could have had even greater success in this period, as it emerged in 1993 that bitter rivals Marseille had indulged in match fixing and numerous improprieties, a view that Wenger had long held. In 1994, after being blocked by the Monaco board from opening discussions with German powerhouse Bayern Munich for their vacant managerial post after being shortlisted for the role, Wenger was released from the club, several weeks after the post had already been filled. After Wenger's departure, the club went on to record two further league championships; under Jean Tigana in 1997 and under Claude Puel in 2000. However, as the decade came to an end, rumours were surfacing that the club was facing numerous financial difficulties. In 2003, these financial problems came to a head. Despite finishing second in the league, the club was relegated to Ligue 2 by the French Professional League for amassing a €50 million ($68 million) debt. Whilst this was reduced on appeal to a ban on purchasing players, it was enough to force President Jean-Louis Campora, who had been in charge for 28 years, to step aside. He was replaced by Pierre Svara, an administrator considered to be close to the principality's princely family but with no footballing experience. The following season saw remarkable success on the field, given the club's financial strife. The team, coached by former French national team captain Didier Deschamps and featuring stalwarts such as Fernando Morientes, Ludovic Giuly, Jérôme Rothen and Dado Pršo, finished third in Ligue 1 and enjoyed a remarkable run to the final of the UEFA Champions League, beating Real Madrid and Chelsea along the way. However, despite the on-field success, the 2003–04 season was the club's worst financial year in its history. Within 12 months, Deschamps had left as coach and Svara had been replaced by Michel Pastor. Russian billionaire Dmitry Rybolovlev bought the club in 2011 and has made it one of the biggest spenders in the football world. With Francesco Guidolin hired to replace Deschamps, one of Pastor's first tasks was to hold on to the players who had turned the club into one of the best in Europe. However, he failed to convince them to stay and their replacements were unable to replicate previous successes. Guidolin lasted only one year, before being replaced by assistant coach Laurent Banide who, in turn, only lasted a year, before being replaced by Brazilian Ricardo Gomes. In 2008, after four years at the club featuring six coaches and only mid-table finishes, Pastor left the club amid severe criticism of his management skills. In 2008, Jérôme de Bontin, a leading shareholder of the club since 2003, took charge of the club, promising a complete shake-up. Under his reign as president, the club brought in players such as Park Chu-young and Freddy Adu, so they did not find much success on the pitch, going through a torrid season and only managing a mid-table finish. De Bontin resigned at the end of the season, replaced by banker Étienne Franzi and a new board of directors. In July 2009, Ricardo Gomes was replaced by former Cannes and Rennes coach Guy Lacombe, inheriting a youthful squad featuring numerous highly lauded youth team prospects, including Cédric Mongongu, Serge Gakpé, Vincent Muratori, Frédéric Nimani, Nicolas N'Koulou, Park Chu-young, Yohan Mollo and Yohann Thuram-Ulien. Lacombe led Monaco to eighth place in Ligue 1 in his first season in charge, but he was unable to replicate this performance in his second season and was sacked in January 2011, with Monaco in 17th place in Ligue 1. He was replaced by former coach Laurent Banide, who was unable to turn around the club's fortunes; Monaco finished the 2010–11 season in 18th, thus becoming relegated to Ligue 2. In December 2011, 66.67% of the club was sold to the Russian billionaire Dmitry Rybolovlev (via a trust under his daughter Ekaterina's name) while the club were bottom of Ligue 2. Banide was sacked due to this poor start to the 2011–12 season, and was replaced by Italian manager Marco Simone. Although he lifted the club to eighth by the end of the season, the club's board targeted promotion for the upcoming season and so fired him and appointed his compatriot Claudio Ranieri, whose attacking style of football saw the club score 64 goals in the 2012–13 season. With the club only losing four times, Monaco finished the season as champions, earning promotion back to Ligue 1. Using Rybolovlev's funds, Monaco were one of the biggest spenders in Europe in 2013, spending roughly £140 million, including a club-record £50 million for Radamel Falcao from Atlético Madrid and £40 million for James Rodríguez from FC Porto. Monaco finished in 2nd place in Ligue 1 in the 2013–14 season and Ranieri was replaced by Leonardo Jardim. The following season, Monaco cut expenses, selling Rodriguez to Real Madrid for €75m and loaning Falcao to Manchester United. Despite the high-profile departures, Monaco finished in 3rd place in Ligue 1 and made it to the quarter-finals of the Champions League, defeating Arsenal in the Round of 16 before exiting at the hands of Juventus. Top-scorer from the 2013–14 season Anthony Martial, who managed 12 goals in all competitions, departing for Manchester United in the summer for a fee of €60m, the highest fee paid for a teenager in football history. This, combined with the sales of Geoffrey Kondogbia, Layvin Kurzawa, Yannick Carrasco, Aymen Abdennour, Lucas Ocampos and other, saw the Monegasque club earn over €180m in the transfer window. Les Monégasques won the Ligue 1 title on 17 May 2017, defeating AS Saint-Étienne 2–0. Radamel Falcao and Kylian Mbappé scored 30 and 26 goals respectively to ensure Monaco won their first Ligue 1 title in 17 years. Monaco went undefeated for the last 20 games of the season, winning 18 of those 20 games. Early in the season, Monaco defeated Fenerbahçe and Villarreal to qualify for the group stages of the 2016–17 UEFA Champions League. The club topped its group, which contained Bayer 04 Leverkusen, Tottenham Hotspur and CSKA Moscow. Monaco staged a dramatic comeback in the Round of 16, losing the first leg 5–3 to Manchester City before beating the English side 3–1 at home to win on away goals. Monaco then defeated Borussia Dortmund 6–3 on aggregate before going down 4–1 over two legs to Juventus. In the following summer, the title winning team was "dismantled". Kylian Mbappé went to rivals PSG on loan, with obligation to buy for a fee of €180m, making it the second-highest transfer fee in history after teammate Neymar, Bernardo Silva and Benjamin Mendy were sold to Manchester City for over €100m combined and Tiémoué Bakayoko was sold to Chelsea for €40 million. Despite this, Monaco managed to finish 2nd in the 2017–18 Ligue 1, but were 13 points behind league winners PSG and managed only two points in its Champions League group. Les Monegasques started off the season poorly, with a 4–0 loss to Paris Saint-Germain in the Trophée des Champions. They followed with a 3–1 win over Nantes, a draw to Lille, and a 2–1 loss to Bordeaux. Then came a string of losses, including 1–2 against Atlético Madrid and 0–3 to Borussia Dortmund in the 2018–19 UEFA Champions League. Following the poor results, Leonardo Jardim was replaced as coach by Thierry Henry. However, Henry's efforts proved worthless, being unable to improve the League's standings and having Monaco eliminated from both the Champions League and the French Cup. He was officially suspended in 24 January 2019, with Franck Passi briefly assuming the role of interim coach. On 25 January 2019, the club announced the return of Jardim, only three months after having fired the Portuguese coach. The iconic nine arches of the Stade Louis II. Monaco played at the original Stade Louis II since its construction in 1939. In 1985, the stadium was replaced with the current iteration, built on a nearby site consisting of land reclaimed from the Mediterranean, which has become a recurring feature of the stadium's seaside surroundings. The stadium is named after the former Prince of Monaco Louis II and houses a total of 18,500 supporters. The Stade Louis II is noted for its iconic nine arches and has hosted numerous athletic events and European Cup finals. Every August from 1998 to 2012, it hosted each instance of the annual UEFA Super Cup, but from 2013 onward, UEFA decided to rotate the event throughout various stadiums. ^ "The origins (1919–1930)". AS Monaco FC. Archived from the original on 19 October 2013. Retrieved 17 October 2013. ^ a b "Russian billionaire Dmitry Poloz takes over Monaco". BBC Sport. 23 December 2011. Retrieved 2 April 2014. ^ "The origins (1919-1930)". AS Monaco. ^ Patrick Reilly (21 September 2010). "Top 10 Promoted Teams Who Stunned Their Top League". Goal. Retrieved 4 October 2018. ^ "Ligue1.com – French Football League – Ligue 1, Ligue 2, Coupe de la Ligue, Trophée des Champions". Frenchleague.com. Archived from the original on 17 November 2008. Retrieved 27 April 2011. ^ "AS Monaco – Dates & results 1985/1986". Bundesliga.weltfussball.at. Retrieved 27 April 2011. ^ a b c Jasper Rees (18 August 2003). "Inside the mind of Arsène Wenger (excerpt from Wenger: The Making of a Legend by Jasper Rees)". The Guardian. ^ a b "Monaco struggling for survival". SI.com. 23 January 2011. Retrieved 24 April 2012. ^ "Campora quits Monaco role". uefa.com. 30 June 2003. Retrieved 24 April 2012. ^ "Monaco: Etienne Franzi président". Sport.fr. 21 March 2009. Archived from the original on 4 April 2009. Retrieved 9 September 2009. ^ "The little princes of Monaco". FIFA.com. 29 January 2009. ^ "Radamel Falcao: Monaco sign striker from Atletico Madrid". BBC Sport. 31 May 2013. Retrieved 2 April 2014. ^ "Martial could cost United £57.6m - Monaco". ESPN.com. 3 September 2015. Retrieved 6 December 2018. ^ "Kylian Mbappe transfer: PSG complete €180 million deal for Real Madrid target | Goal.com". www.goal.com. Retrieved 6 December 2018. ^ "Thierry Henry named AS Monaco coach". AS Monaco. 13 October 2018. Retrieved 6 December 2018. ^ "Communiqué officiel". AS Monaco (in French). 24 January 2019. Retrieved 24 January 2019. ^ "Communiqué officiel". AS Monaco (in French). 25 January 2019. Retrieved 25 January 2019. ^ "Players". AS Monaco FC. ^ "Reserves". AS Monaco FC. ^ "Organigramme" (in French). AS Monaco FC. Archived from the original on 19 November 2010. Retrieved 4 March 2014. Wikimedia Commons has media related to AS Monaco.